ISRAEL = MAFIA RUN TERROR STATE = HERE IS THE PROOF | Concise Politics -- Your Time should NOT be wasted. 1. King David Hotel, July 22, 1946. 2. Sharafat, Feb. 7, 1951. 3. Deir Yassin, April 10, 1948. 4. Falameh, April 2, 1951. 5. Naseruddine, April 14, 1948. 6. Quibya, Oct. 14, 1953. 7. Carmel, April 20, 1948. 8. Nahalin, March, 28, 1954. 9. Al-Qabu, May 1, 1948. 10. Gaza, Feb. 28, 1955. 11. Beit Kiras, May 3, 1948. 12. Khan Yunis, May 31, 1955. 13. Beitkhoury, May 5, 1948. 15. Az-Zaytoun, May 6, 1948. 16. Tiberia, Dec. 11, 1955. 17. Wadi Araba, May 13, 1950. 18. As-Sabha, Nov. 2, 1955. 19. Gaza Again, April 5, 1956. 20. Houssan, Sept. 25, 1956. 21. Rafa, Aug. 16, 1956. 22. Qalqilyah, Oct. 10, 1956. 23. Ar-Rahwa, Sept. 12, 1956. 24. Kahr Kassem, Oct. 29, 1956. 25. Gharandal, Sept. 13, 1956. 26. Gaza Strip, Nov. 1956. David Ben-Gurion — #1 Ethnic cleansing of 750,000 Arabs = MASS MURDER in hundreds of Palestinian villages in 1948 = Most victims were noncombatant dirt-poor farmers and their families who lived in mud huts + Had no weapons + Said that “without Deir Yasin there would be no Israel.” + MURDERED 10% CHRISTIANS in 1948 + 10% of property ROBBED was owned by Christians. Levi Eshkol — #2 Ethnic cleansing of 250,000 Palestinians refugees, most of them noncombatant farmers and their families. Menachem Begin — #3 Preeminent terrorist of Middle East = Begin described a massacre as “a splendid act of conquest” = Albert Einstein and 25 other Jewish intellectuals called Begin and his ilk terrorists, fascists and religious fanatics in a 1948 open letter to the New York Time = LIKE NAZIS = MURDERED Brits, Arabs and Jews with reckless abandon, including civilians = Deir Yassin massacre + Terrorism attack in bombing of the King David Hotel. Ariel Sharon — #4 Murderous INSANITY in Qibya, Sabra and Shatila refugee camp massacres. 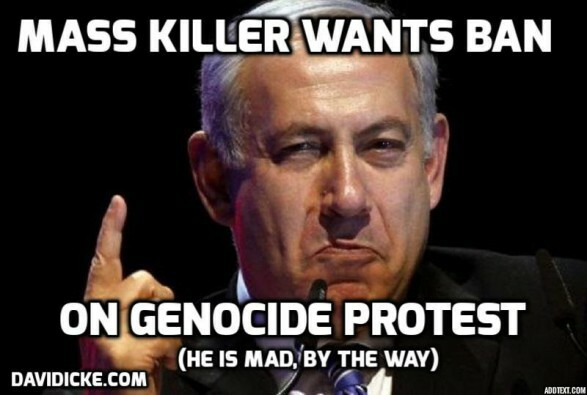 Benjamin Netanyahu — #5 MURDER and mutilations of 1,000s of children + RUNS LARGEST APARTHEID PRISON ON EARTH + “mass expulsions among the Arabs of the occupied territories” + Presided over multiple MASS MURDERS IN PALESTINE + CONTINUOUS TRICKLE OF MURDRERS AND KIDNAPPINGS + LAND ROBBERY + SETTLEMENT FRAUDS. Yitzhak Shamir — #6 MURDERED British and Swedish Nobles for seeking to have Arabs treated as equals of Jews = ASSASSINATION of Britain’s Lord Moyne and Sweden’s Count Folke Bernadotte + Involved in the Deir Yassin massacre and other acts of terrorism + Leader of Jewish STERN GANG terrorists doing assassinations. Ehud Barak — #7 Cross-dressing assassin worked in death squads to MURDER two women + two policemen + Christian Poet known as “The Conscience” = Invaded Beirut = Interviewed for Steven Spielberg movie Munich and described the raid with “evident relish and nostalgia” rather than remorse. Golda Meir — #8 Threatened to destroy the world with nukes during a BBC in Alan Hart interview + Insisted Palestinians “did not exist” as a people + Ordered Operation Wrath of God to MURDER civilians + ASSASSINATION of Ehud Barak + other botched assassinations (Lillehammer, Norway MURDER of an innocent waiter) + Claimed land ROBBED from the Palestinians could not be returned because they “did not exist” as a people LIKE NAZIS claiming they were not human beings. + GOLDA “Mother Israel” Meir = Ultimate terrorist using Shimon Peres (The terrorist mastermind) = Placed an arsenal of nuclear weapons in MEIR’s hands. Shimon Peres — #9 USED NETANYAHU as SPY to STEAL AMERICAN NATIONAL SECRETS on nuclear weapons and NUKE TRIGGERS. = Created the nuclear weapon program SO Israeli leaders CAN threaten the world with nuclear blackmail (the “Samson Option”). ISRAELIS ARE TERRORISTS = Terrorism Plank of Israel’s Political Parties = Largest political party, Kadima was founded by a terrorist, Ariel Sharon + Kadima’s platform states that the Israeli nation has a national and historic right to the whole of Israel = Jerusalem + West Bank + Likud was founded by a terrorist MURDER OF BRITS AND EUROPEANS, Menachem Begin = Party of terrorists like Yitzhak Shamir and Ariel Sharon = Likud’s charter rejects a Palestinian state, claims that all Jerusalem belongs to Israel and says: “The Jewish communities in Judea, Samaria and Gaza are the realization of Zionist values = ILLEGAL LAND ROBBERY AND SETTLEMENTS. ROOT OF ISRAELI TERRORISM = Ze’ev Jabotinsky spiritual LEADER OF RABBIS TALMUDIC DEVIL GOD EVIL = ROTHSCHILD’S EVIL = FOUNDATION OF Likud and Yisrael Beiteinu. = Jabotinsky advocated an Israel based on the British imperial/colonial mode = SUPREMACIST + RACIST + FASCIST = Said “the answer to this question [peace] does not depend on our [Jewish] attitude to the Arabs; but entirely on the attitude of the Arabs to us and to Zionism.” = SHOW TOTAL indifference to Arabs, but ARABS MUST BOW DOWN to ISRAELIS = IGNORED FACT Arab majority had lived in Palestine for many centuries. This entry was posted in ISRAEL = MAFIA RUN TERROR STATE = HERE IS THE PROOF and tagged ISRAEL = MAFIA RUN TERROR STATE = HERE IS THE PROOF. Bookmark the permalink. ← AMAZING THE JEWISH-ZIONIST ROCKS TO TURN OVER IN AMERICAN GOVERNMENT AND QUASI-GOVERNMENT SEEMS ENDLESS!